Towards the end of a sporting season, it's not unusual to hear the commentators call a team a "mathematical" chance to achieve some target - be that winning a premiership, making the finals, avoiding relegation, whatever. What this means is that there is at least one combination of events (usually discounting other teams being disqualified) that could bring it about, but it's almost vanishingly unlikely to occur. Very seldom is this a more appropriate term than for the current chances of Greater Western Sydney getting into the top 8 and making the AFL finals this year - so much so that commentators probably aren't even aware that it is a mathematical possibility. This on its own is still not enough to guarantee GWS a place, however - there are 9 other teams on the ladder that are also striving for a spot in the top 8. For GWS to make the finals, none of these sides can finish with more than 32 points (8 wins) at the end of the season. Therefore every game that involves one of these sides - 46 games, excluding the 16 already accounted for by GWS and Port's games - can make or break GWS's finals chances. In particular, West Coast, Carlton and Adelaide cannot get any more than 1 win for the rest of their remaining games. In fact, there are only 10 games that don't affect GWS's chances - the games between top 7 sides, who already have more wins than GWS can possibly get and are guaranteed to place above them on the ladder. 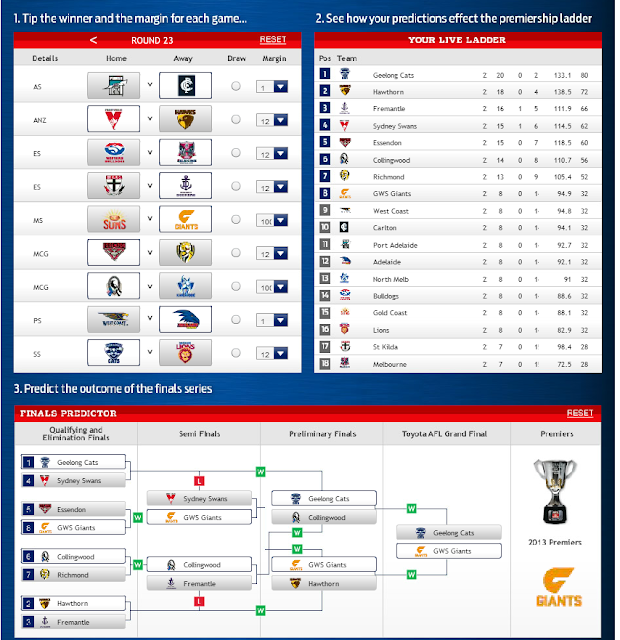 Using a computer to calculate the possible combinations in which this could happen comes up with 150,744 ways for GWS to place equal 8th. Even assuming that all teams will have a 50-50 chance of winning each game for the rest of the season (discounting draws), an assumption which is very kind to GWS to say the least, this would give them a 150,744 / 262 = 3.27 in a hundred thousand billion chance of finishing equal 8th on points. To put this into perspective, imagine a lottery where you have to pick which 6 balls out of 40 will be drawn - a 1 in 3.8 million chance. Now imagine only entering that lottery twice in your life - and winning both times. Even THAT would be twice as likely as GWS finishing equal 8th, on a good day. To make the finals, from this point they need to gain a higher percentage than the other 5 teams. Currently, they are on 52.21%, having scored only 1003 against their opponents' 1921 points. On the other hand, their currently best-placed opposition, Port Adelaide, has a percentage of 113.7%, scoring 1317 to their opponents' 1158. This informative site tells us that the average score in an AFL this season so far is 92.43, and the average margin for a game is 36.92. 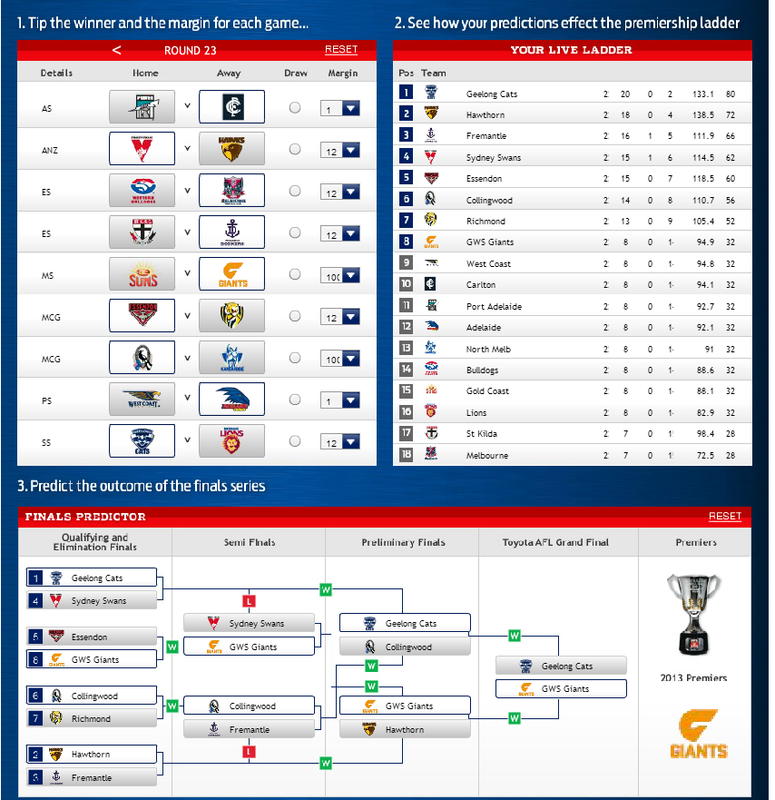 So a roughly "average" game of AFL would involve the winner with 110.89 points and the loser with 73.97. If we assume that GWS's 8 winning games follow this scoreline, as well as Port's 8 losing games, then we end up with GWS having an improved percentage of 75.22% and Port with a dented percentage, but still plenty enough for finals, of 93.33%. So, obviously just winning is not going to be enough for GWS to leapfrog Port and its other finals rivals. Let's assume the same as above, but this time work on the assumption that GWS has somehow found a secret scoring weapon and is able to rack up ridiculous scores while keeping their opponents to an average score of 73.97. They would need to be able to score, on average, 167.78 points in order to beat Port's percentage - an average winning margin of 93.8 on their run home - and hope that none of their other rivals have had a similar late-season percentage boost themselves. I'll leave it to someone else to work out how often a team has won 8 games in a row by an average margin of at least 93.8 in AFL history. Our conclusion: is it possible for GWS to make the finals? Mathematically, yes. Are they going to make the finals? No. But it'd be a hell of a story if they did! You did forget one crucial element - and let's face it is far more likely than the Giants making the finals - is the remote possibility of a team losing points. Let's say for instance a team -- I'll call them Shmessendon - have been involved in a performance enhancing drug scandal. And they have all there points stripped away as a result. Making West Coast's 7 wins, and not Port Adelaide's 8, the target. How does that change things? Not being mean! But would me still buying two lottery tickets be better odds? Though the other teams' percentages are generally worse than Port, note that North Melbourne's percentage is actually *better*, and it just so happens that in the scenario I chose they weren't one of the finals competitors. So the chances are still going to be WAAAAY below two lottery tickets odds. The percentage alone is probably an unprecedented hurdle even if they got the necessary wins/losses going their way.